Budget accommodation, with parking and breakfast included. Close to MCG with some shops and food venues close. Room and bathroom very clean although room did have a musty spell.. Check in lady very polite and helpful. I would certainly stay there again and recommend it to friends. 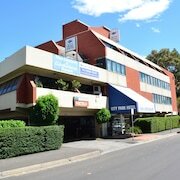 Excellent pristene clean location was close to train station easy access into cbd. If you're looking for something a little different than the traditional hotel experience, a bed and breakfast could be a great option for your getaway. Although it might be challenging to find B&Bs in the heart of the city, there are 1843 accommodation options and 20 B&Bs in the surrounding area. 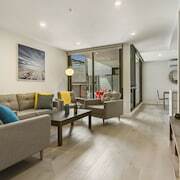 When you want to explore some attractions in town, South Melbourne Market and St Kilda Road are worth a stop. When you want to see some attractions in town, you might consider a visit to South Melbourne Market and St Kilda Road. Melbourne Cricket Ground and St. Kilda Beach are also some sites to visit if you want to see more of the area. What are the best transport options in and around South Melbourne?